Articulated the concept of bioregions to define places where people live in terms of climate, watersheds, land forms, soils, native plants and animals, other natural characteristics, and appropriate human culture. Reinhabitation, or becoming native to places, is the appropriate way to adapt to bioregions. Published "bundles" on various planetary locales, North Pacific Rim, North America, The Rockies, Hudson Estuary, and on the subjects of Renewable Energy and Bioregions and Eco-Decentralist Design. Created the Frisco Bay Mussel Group in 1976 to discuss reinhabitation of the San Francisco Bay Area. Successfully fought the California Water Project Plan to divert more Sacramento River water to the San Joaquin Valley and Southern California through newspaper ads and meetings. Published Watershed Guide and Living Here to broaden local ecological consciousness of the Bay Area. Toured with "Reinhabitory Theater" of multispecies stories in 1977 throughout Northern California to inspire bioregional consciousness. In 1978, published REINHABITING A SEPARATE COUNTRY: A Bioregional Anthology of Northern California to describe the Shasta Bioregion (Northern California). "A pioneer and genre model" according to one critic which many subsequent efforts in other places. Began the Planet Drum Foundation review Raise The Stakes the next year to network with other bioregional groups. Co-sponsored the first North American Bioregional Congress in 1984 to bring together representatives of bioregional groups. Facilitated writing the statement "Welcome Home" which served as a manifesto for the burgeoning bioregional movement. Co-sponsored six more biannual congresses (now termed "Turtle Island Bioregional Gatherings") through 1996 in Morelos, Mexico. 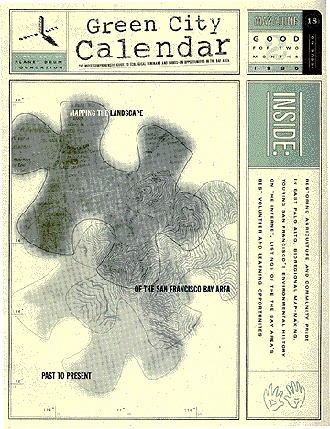 Held benefit in 1986 to fund a series of meetings with Bay Area groups to develop a Green City Program of urban sustainability based on bioregional principles. 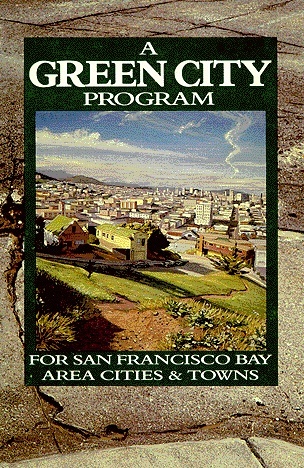 Published findings as A Green City Program For the San Francisco Bay Area & Beyond in 1989. Created Green City Project to carry out ideas in GCP book. Developed four main areas: 1) Volunteer Network to connect general public with active groups, 2) Green City Calendar to detail day-by-day projects on a bimonthly basis, 3) Education+Action projects in K-12 schools to create permanent works on ecological themes, and 4) Workshop/Workdays to first discuss and then participate in projects ranging from creek restoration to putting a rooftop garden on the Senator Hotel for formerly homeless people. In 1991 convened first Shasta Bioregional Gathering in Napa County and co-sponsored subsequent Gatherings in Mt. Shasta, Monterey, Sonoma through 1995. Held annually to bring together activists from throughout the bioregion to discuss successes and problems with special emphasis on the host location. Undertook planning for a Bioregional Association of North American groups and individuals including Mexico and Canada in 1994. Held founding meeting in San Francisco in July 1996. Planet Drum Foundation staffers have travelled to organize groups in Europe, Australia and Japan. The Foundation continues to be the main networking group for the bioregional movement with over 35 publications as of 1996, ongoing talk, workshop and performance services, and a growing membership numbering 1,000 to date. Berg was one of the original Diggers that scandalized San Francisco in the 1960s.